The First Friday Art Walks are the signature event of Denver's Art District on Santa Fe. The District comes alive as thousands descend upon the Santa Fe Drive, year-round, rain or shine, for the First Friday Art Walks from 5:30-9:30 p.m.
View art from hundreds of artists in galleries, studios, co-ops, upstairs, downstairs, in alleys, on the street—everywhere! Check out all the details below. Our District spans from 13th on the North to Alameda on the South, Kalamath to the West, and Inca to the East. The bulk of our galleries are in a walkable area between 5th and 11th Avenues. 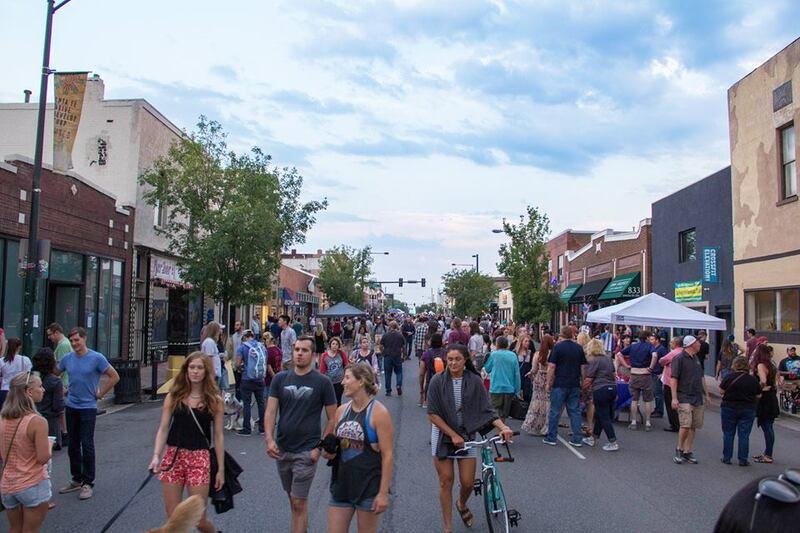 In addition to our member restaurants and breweries, you'll find plenty of restaurants and dozens of food trucks during First Fridays along 7th and 9th Avenues. Check our Events page for all events happening during the First Friday Art Walk along with our Facebook page for the most up-to-date information. Sorry, stationary street vending is not permitted along Santa Fe Drive nor is mobile street vending without a permit from the City of Denver. If you would like to have your artwork represented by a gallery, please contact one of our member galleries and plan ahead, as their show book months in advance.